Amity Home Care offers companion, homemaking and personal care services from experienced and highly qualified CNA, HHA and PCA. Our services are all none-medical and includes but are not limited to transportation to and from appointments, medication reminder, light house cleaning, meal preparation, reading aloud, shopping, safety supervision, monitoring the home, clothes selection, changing linen, assisting with pet care and more. 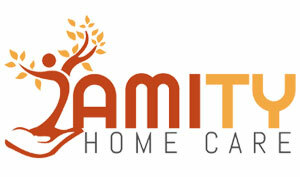 Amity Home Care also provides free in-home care assessments and free safety assessments for our clients. We utilize the latest technology to ensure family member are kept abreast of their love ones activities and health. Family members also have the ability to view caregiver activity online, view times specific task were completed and make direct payments for services rendered. All caregivers are are bonded and fully covered by worker's comp insurance and liability insurance. This protects families and clients from being held liable for work related accidents that results in injury for the caregiver.